This week’s favorite meal of the week post is all about the grapefruit. I have always liked grapefruits, but I’ve recently remembered why they are so great. They seem to be the only sweet (and relatively inexpensive fruit) right now. In college, they were sometimes the best fruit in the dining hall at this time of year. And right now, they seem to be the best fruit at TJ’s (the berries are too expensive, the apples and oranges are bad, and it’s too early for a lot of other good things). 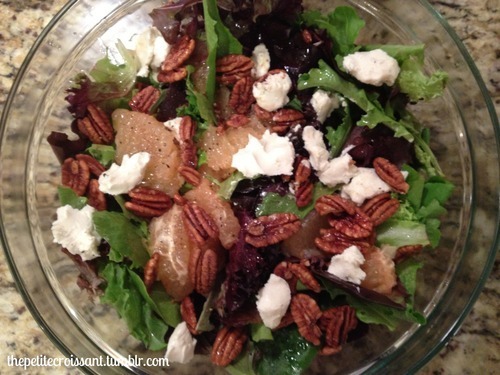 Today’s meal is a mixed green salad with grapefruit wedges, goat cheese, and candied pecans with a honey dressing. Pretty simple, and nice and light for the summer. Note: I don’t use a lot of dressing, but if you like more, I’d increase the quantity to 1/4 cup for the olive oil and vinegar and to 2 tablespoons for the honey.